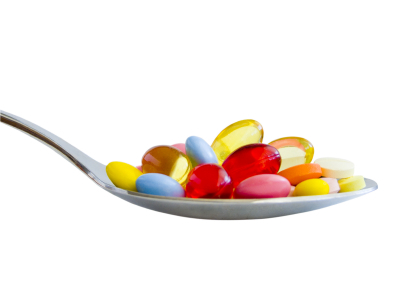 How many of you take a multivitamin or other kinds of supplements to ensure you are meeting your body’s needs for vitamins, minerals and other substances? My guess is a fair number – whether it is to improve bone health, fight a cold, get your dose of omega-3 fatty acids, raise your iron levels, improve your performance in your upcoming race….or any of the other countless claims you’ll find on the back of a supplement bottle. Some of these claims are valid, supported by numerous scientific studies that have been published in reputable journals – others not so much. Will those B vitamins really give you energy, if they have no calories and you are already consuming enough from food? Are those daily mega doses of vitamin C really preventing you from getting a cold or are you just producing expensive urine? I’m not trying to knock supplements – they can be very useful (even essential) during pregnancy, for vegans and vegetarians, for calcium and iron supplementation in deficient individuals, and for all the people who do not have the time, energy or desire to think about what they are eating and whether or not they are meeting their dietary needs. All I’m saying is that when it comes to supplements, it’s important to take what you read with a grain of salt and never think of supplementation as a substitute for certain foods (unless you do not eat that food in your diet). The goal should always be to meet your needs as much as you can through food because some things, like phytochemicals for example, can’t be bottled – well, they CAN but they won’t give you the same, or any, benefits. Obviously, if you do not eat certain things – such as animal products – you’ll probably benefit from taking supplements of certain vitamins that are predominantly found in animal sources, like some of the B vitamins. But if you eat a wide variety of nutritious foods, you can easily meet your needs through food alone. In case you’re wondering why I’m writing about all this – I have my last midterm this afternoon for Nutrition & Health, covering protein, vitamins, water and minerals. As I mentioned at the end of last week’s post, I thought it might be helpful to do a quick rundown of the important vitamins and minerals to test your knowledge (and mine!) and perhaps introduce you to a few new pieces of information. I’m short on time so I’ll just review the vitamins today. Vitamins are essential nutrients but differ from the macronutrients (carbohydrate, fat and protein) in that they are non-caloric and needed in very small amounts. Some vitamins are fat soluble – vitamins A, D, E and K – while others are water soluble – vitamin C and the B vitamins (thiamin, riboflavin, niacin, folate, B12, B6, biotin and pantothenic acid). What does this mean? Simply that some are stored in the liver and fatty tissues (fat soluble) and thus do not need to be consumed as frequently, while others (water soluble) are readily excreted by the body and thus need to be consumed on a more regular basis. This also means that toxicity is more of a concern with fat soluble than water soluble vitamins because they can build up in your tissues (particularly the liver) – but most often this only occurs from over supplementation or chronic consumption of fortified foods. Vitamin A is predominantly known for its role in vision, as severe deficiency of vitamin A results in permanent blindness. Other roles include maintenance of healthy bones and teeth, regulation of gene expression (protein synthesis), maintenance of the cornea (the transparent outer front part of the eye), skin and mucous membranes (things like our digestive and respiratory tracts), and it also supports immune function. The most active form of vitamin A in the body is retinol, which is found in animal sources such as fortified milk and other dairy, liver (the richest source, since vitamin A is stored in the liver) and eggs. Surely at some stage you’ve been told that carrots are good for your eyesight – that’s because the precursor for vitamin A is beta-carotene, which is found in plant sources such as sweet potato, apricots, carrots, mango and other fruits and vegetables within this yellow to red to orange color. The body does not use this form as efficiently (12 micrograms of beta-carotene is the equivalent of 1 microgram of retinol), but they are still great sources of vitamin A and have been linked with reduced cancer risk, perhaps because of the phytochemicals they contain. Spinach and fortified cereals are additional sources of vitamin A.
Vitamin D plays an important role (along with calcium, the most abundant mineral in the body) in maintaining bone health during growth and throughout life. Vitamin D may also help prevent chronic disease development, but research is ongoing in this area. Vitamin D is one of the few vitamins that we can make ourselves, with the help of UVB sunlight. Sunlight transforms a cholesterol compound in the skin (one of the reasons why it is important to have cholesterol in our body!) into a vitamin D precursor, which is then absorbed into the blood and sent to the liver and kidneys to be converted into the active form of vitamin D. However, the goal is to obtain vitamin D from food as well – good sources include fortified milk, egg yolks, enriched cereals and fish products (salmon, canned tuna and cod liver oil, for example). Vitamin E is best known as a powerful antioxidant. It protects the body against damage by free radicals, or highly reactive oxygen molecules formed during normal cell metabolism. Good sources include vegetable oils (fresh, raw oils like canola oil are best, since vitamin E is destroyed by heat, food processing and oxidation), green leafy vegetables, seeds and nuts, wheat germ and whole grain foods (lightly processed). Vitamin K‘s main function is to help activate proteins involved in blood clotting. It also plays a role in bone health in that it assists in the synthesis of bone proteins, which bind minerals (calcium and phosphate) to bone. Like with vitamin D, our body can create vitamin K (our intestinal bacteria or healthy gut flora does this) so we are able to meet our needs both from food and from within our own body. The only rich animal food source is liver, while the richest plant sources are dark leafy greens (1/2 cup of dark leafy greens exceeds our daily needs). Other sources include oils, fortified cereals and grains, cabbage, cauliflower, soybeans, milk and eggs. Vitamin C is probably most well known for its role in supposedly fighting the common cold, in addition to preventing scurvy (which I believe we all learned about in grade school??). With regards to the latter, vitamin C maintains the connective tissues in the body, playing a critical role in the formation and maintenance of collagen (which is why without vitamin C, we see symptoms including bleeding gums and loose teeth, which indicate collagen breakdown – at least I remember reading about that when learning about scurvy many many years ago…). Vitamin C supports immune system function and protects against infection, and some research has shown that it may decrease the duration and severity of symptoms, but it hasn’t actually been shown that it prevents a cold. So when you pop those vitamin C pills, there’s probably more of a placebo effect going on, as well as a weak antihistamine effect if you’re taking large doses. Lastly, vitamin C acts as an antioxidant – in particular, it protects iron from oxidation in the intestine (and helps us absorb more iron from certain foods if eaten in the same meal) and helps conserve vitamin E, another antioxidant. The best sources of vitamin C are fresh fruits and vegetables, such as citrus fruits, bell peppers and broccoli. Since it is water soluble and breaks down easily, try to cut your fruits and veggies right before you plan to eat them. Also be sure not to overcook your vegetables or steam them directly in water – use a steamer (or even the microwave) or blanch your veggies to retain their nutritional value. The B Vitamins are a group of vitamins that play important roles in the metabolism of energy yielding nutrients (carbohydrates, fats and proteins), protein synthesis and cell synthesis, among other things. These are the vitamins that often require supplementation, particularly folate for pregnant women and B12 for vegetarians/vegans. Thiamin (B1), riboflavin (B2), niacin (B3), biotin and pantothenic acid all help release energy that is stored in the macronutrients – the first three in particular play important roles in energy metabolism, and are all found in fortified grain products. The latter two are usually not of great concern in terms of deficiency, as most people meet their required needs. Thiamin is also found in moderate amounts in most nutritious food sources, including legumes, potato, lean pork chop and sunflower seeds, for instance. Riboflavin is present in dairy products (this is why milk is packaged in cartons rather than glass – because riboflavin is destroyed by light), eggs, and some meat and vegetable products. Niacin appears in many protein foods, including dairy, eggs and poultry, and it can also be converted within the body from one of our essential amino acids. Thus, if you are consuming enough protein, you are most likely meeting your niacin needs. Folate is crucial in the synthesis of new cells (helps create DNA) and in normal protein metabolism, while vitamin B12 helps to maintain the sheaths that surround and protect our nerve fibers. Both vitamins work as a team to make red blood cells, and depend on one another for activation. Folate is usually taken as a supplement in the form of folic acid, which is more readily absorbed than folate, by pregnant women to prevent neural tube defects. Enriched grains are a good source of folate – this is actually why our grains are enriched! The defects occur in the first days or weeks of pregnancy, so it’s important for women to ensure they are meeting their folate needs before they get pregnant. Other food sources include green leafy vegetables, avocado, legumes and seeds. B12 is only found in foods of animal origin, so if you do not consume animal products, this is where a supplement is very useful. Lastly, vitamin B6 plays an important role in protein metabolism, and helps to make hemoglobin for red blood cells (which is what carries the oxygen in our blood) and maintain blood glucose levels, among other things. It also helps with the conversion of the essential amino acid tryptophan to niacin – another example of how the B vitamins work together and depend upon one another. Animal proteins are the best source of B6, but you can also find it in beans, legumes, and any soy-based products. And that concludes the vitamins! I probably lost your attention by now, but if not, hopefully you learned something. 🙂 Now it’s time to go test my knowledge – last midterm of the semester! But first – a big shout out to all the Boston marathoners out there, including Kristy (Run the Long Road). Good luck with the heat today – stay safe and have an awesome race everyone! As much as I’m bummed not to be running Boston today, I guess it was a blessing in disguise that I didn’t make the cut during registration. I’ve never run in this type of heat! Then again, I’d take Boston in any weather! 🙂 Really hoping I get lucky in Chicago and get a nice cool day!